Aren't these gorgeous? They aren't mine. Well not completely. The cookie recipe, yep that's mine. But I didn't bake or make these darling cookie sandwiches. These are courtesy of the all vegan, all gluten-free, all-the time blog. Check out xgfx! Kittee Berns tagged me on fb, and I had to share this photo with you. 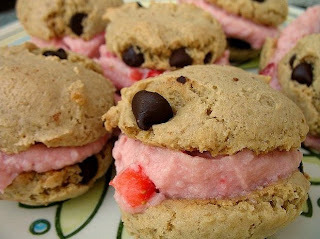 I love that she used fresh strawberries to color the filling - look how bright and playful! If you haven't tried my gluten-free chocolate chip cookies, they're waiting for you here! Have to keep it sweet and short today, as my manuscript is due tomorrow. (!!zoinks!!) More soon! These are super adorable and look so yummy! Super excited for the new book, Dreena! These look great to try with the nieces & nephews - off to check out the recommended blog too!